In which summer vacation begins with a joyous trip to the graveyard, a question of theological geography is cleared up, and Anne prepares for a visit from a literary luminary; and in which our narrator asks if anything interesting happened while he was gone. Hey, remember me? Been a long time! 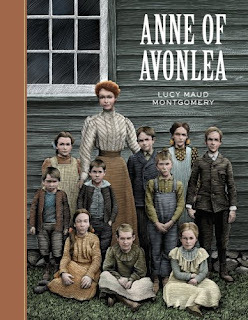 Almost exactly a year to be specific, after which an escape back to Avonlea — which, apropos of nothing, is in Canada — is sounding really good. First up, our cover this time around comes from a 1987 edition published by the Australian firm of Angus and Robertson, where they published the whole series with covers that included something breaking out of the frame for some reason. 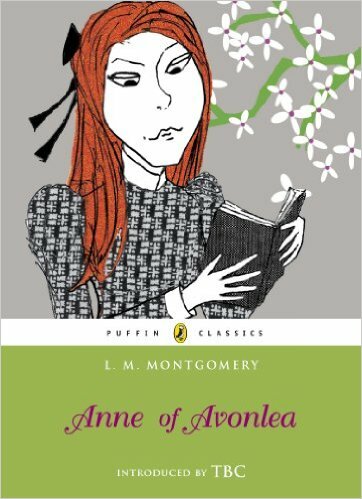 I'd like to think that this symbolized Anne's out-of-the-box thinking or something, but they probably did this with lots of other books as well. And frankly, I don't know if I really feel comfortable with a post-modern, fourth-wall-breaking Anne. 8:35 - "How fair the realm / Imagination opens to the view." All right, I am totally drawing a blank on where this quotation comes from. All the sources I can find list Ms. Montgomery as its author, though it's clearly formatted as a quotation in the text. 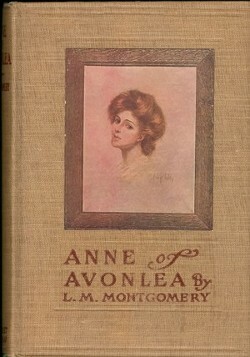 Moreover, Montgomery has quoted this more than once: in a 1903 diary entry (six year before Anne of Avonlea was published and in a 1927 letter, for instance, each time clearly delineated with quotation marks. Looking for only part of the phrase (in case she's paraphrasing) gets the same results. Anyone else have any ideas? 8:55 - "east o' the sun, west o' the moon." Oh good, this one's easy. This is from a Norwegian folk tale of the same name, where the title refers to the impossible-to-find location of the troll castle the heroine's husband was spirited away to. Also her husband was a bear. I think I may actually read this as our next Short Story Interlude, if only to tell you the personal connection I have with it and explain one of my more esoteric tags. Which, FINE, I've already started recording again, sheesh. Quit bugging me, Lowell. 25:50 - "In the elder days of art / Builders wrought with greatest care / Each minute and unseen part / For the gods see everywhere" Ah, again helpfully sourced in the text! This is from "The Builders," by Henry Wadsworth Longfellow in his 1850 collection The Seaside and the Fireside (the "Fireside" portion, in case you're curious). Longfellow, incidentally, was part of the group of 19-century New England poets called the Fireside Poets, which also included James Russell Lowell. Montgomery had certain preferences. In which the twins will be staying with Anne and Marilla for a little longer, to no one's surprise, a theological discussion is had, and a potential disaster for the Improvement Society is averted by political corruption; and in which the narrator just sort of gives up on keeping all the very minor characters' voices straight. Your browser doesn't support HTML5 embedded audio! Oh no! Would you like to download an mp3 instead? This has what appears to be an actual vintage photograph, which works fine as it's at least roughly the right time period and age to be Anne. I am curious, though, as to what exactly is going on with her left hand there. Is it just me, or is that handbag rather blatantly photoshopped in? Why is her hand in such an awkward position? Is that photoshopped too? Why would they do either of those things? Why is the bag flying up like that? Is she supposed to have just moved her forearm up very quickly for some reason that the rest of her body is unaware of? Is it just about to whap her in the face? I DON'T UNDERSTAND WHAT'S HAPPENING. If you would like to read along, the text can be found at Project Gutenberg. No reading ahead, though! In which Anne has a very cranky day and finds her personal educational philosophy slipping, but then celebrates a pseudo-birthday by exploring the countryside and learning a terribly tragic story; and in which our narrator wonders whatever happened to Anne's toothache, because she should really get that checked out, seriously now. Today's cover is from a 1995 Norstedts printing of the Swedish edition of Vår vän Anne. I like that this one shows Anne with (presumably) Davy and Dora, who I have never seen featured anywhere. Heck, they're hardly ever even mentioned when talking about these books, so it's rather nice to see them on a cover. In Sweden, anyway. I also appreciate that Davy looks like he's trying to claw his way out of those fancy clothes that are strangling him. Unnecessarily complex notes to follow! 10:56 - "by what somebody has called 'a Herculaneum effort.'" Herculaneum was an ancient Roman city that was, like the more famous Pompeii, buried by the eruption of Mount Vesuvius in 79 CE. It was wealthier than Pompeii, and actually better preserved, containing organic remains like wood, food, beds, and even skeletons. The destruction of Pompeii, though, was famously witnessed and described by Pliny the Younger, so it's distinctly the better-known. Of course, that doesn't have much to do with this quote, which is a malaprop for the idiom "a Herculean effort." I'm not sure who the "somebody" is that Montgomery is attributing this phrase to, though. My best guess comes from an 1894 travelogue called Our Journey Around the World, by Rev. Francis Clark and Harriet Clark, where the narrator says "with a Herculaneum effort, as Mrs. Partington would have said..." Mrs. Partington turns out to be a character created by American humorist B. P. Shillaber in the 1850s who is described as an American Mrs. Malaprop (who, in turn, was from the play The Rivals by Richard Brinsley Sheridan and who, of course, gave her name to the practice of humorously replacing one word for another, similar-sounding one). The texts the Mrs. Partington are from, though, don't appear to be readily available online, at least not in searchable form, and what I can find does not appear to use particular term. I found other people in the 1800s making this same malaprop, though, so maybe it was just a semi-common joke with no specific source. That keep her from rest. MACBETH: Cure her of that! Which weighs upon her heart. One should note that by quoting this, Anne is casting herself in the part of Lady Macbeth, guilt-ridden over the murder of King Duncan. 13:37 - "Every morn is a fresh beginning / Every morn is the world made new." Anne here is caroling the start of the poem "New Every Morning," from the 1889 book A Few More Verses by Susan Coolidge (1835-1905, real name Sarah Chauncey Woolsey, and also author of, of course, Verses). As far as I know, it was never set to music. If it ever was, it most certainly was not whatever travesty I saddled it with. 17:45 - "harrowing." A harrow is an agricultural tool made up of many spikes, discs, or tines which are dragged across plowed soil to smooth it out and break up large clump of dirt, giving it a finer and more finished appearance that is also better for seeding. This is also where the word "harrowing" comes from, as in "a harrowing experience." Because, well, imagine being dragged through this sucker. 18:17 - "Begone, dull care!" This comes from an old English folk song that dates back to at least the 1600s, and possibly earlier. 19:14 - "It would be too hot to hold some folks." ...yeah, no, I still have no idea what Jane is so "sagely quoting" here, if indeed anything. 20:21 - "elephant's ears." I'm not sure which of the various related plants referred to as "elephant ears" they are referring to, but as far as I can tell none of them would be described as "graceful" or "feathery," or appropriate for "picking a big bunch," as they're primarily known for their very large, leathery, heart-shaped leaves rather than their flowers. In which Davy makes a good deal of trouble due to not being brought up right, and Anne writes a letter to someone we don't care about relating numerous funny, strange, or creative things her students have said; and in which our narrator is pretty sure that if Anne were around today she'd totally have her own Tumblr. 12:59 - "asseverated." Man, the Pyes animadvert, Davy asseverates... Ms. Montgomery, I love you and I love your work, but you need to put down your thesaurus for a while. You can just say that Davy declared, or asserted, or stated earnestly or something. 21:00 - "Thomas à Becket." AKA St. Thomas of Canterbury, Thomas Becket was the Archbishop of Canterbury during the reign of King Henry II in the twelfth century. Though the two had started out as friends, after his election to the archbishopship (... is that a word? That doesn't look right.) Becket had a bit of a change of heart and came into conflict with the king regarding the relative rights of the crown and the church. It got so bad between them that in 1170 Henry said... something. It's uncertain what, exactly, though tradition states it was "Who will rid me of this troublesome priest?" Whatever it was, it was interpreted (rightly or wrongly) by four of his knights as an order. They found Becket in Canterbury and demanded he come and account for himself. He refused, went in to say vespers, and they killed him. The Catholic and Anglican churches both venerate him as a martyr and a saint. You might notice something missing from the above account, though: the "à." It's not actually part of his name, and no one's entirely sure why people sometime in the 1600s or so started putting it in there. Some say it was in imitation of Thomas à Kempis for some unknown reason. It doesn't even make sense in Becket's name, because it means "of" or "from" (so Kempis's name actually means "Thomas from Kempen," where Kempen was his hometown.) But Becket wasn't from anywhere named "Becket." One of those weird linguistic mysteries how it really got and stayed there for so long. 21:05 - "William Tyndale wrote the New Testament." Tyndale was a 16th-century English scholar, best known for his translation of the Bible into English at a time when unauthorized English Bibles were against the laws of both the Church of England and England itself. His was also the first English Bible to work directly from Greek and Hebrew texts (rather than working from later translations into Latin), and the first to be printed on the printing press. He later went on to vocally disapprove of King Henry VIII's divorces. For these varied crimes, he was eventually convicted of heresy and burned at the stake. Well, strangled to death while tied to the stake, and then burned. 21:09 - "Claude White says a 'glacier' is a man who puts in window frames!" Claude White is of course looking for the word "glazier." 22:32 - "carded rolls." Carding is a process of basically turning a raw, fibrous material like cotton or wool into a useful form by untangling the fibers, laying them out parallel to each other, and locking them together in a sort of web, using a sort of brush/comb called a card. This creates a sort of mat that can be pulled up off the card in rolls that can then be used to spin out yarn. In which, as explained handily by the chapter title, Marilla Adopts Twins and hi-jinks ensue when one turns out to be the anti-Paul Irving, followed by the completion of the A.V.I.S. 's first project which is ruined by those damn dirty Pyes. Hey, it's Lucy Maud Montgomery's 141st birthday today! 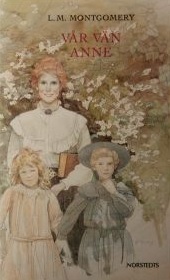 As is their wont, Google honored her with three Doodles depicting scenes from Anne of Green Gables. 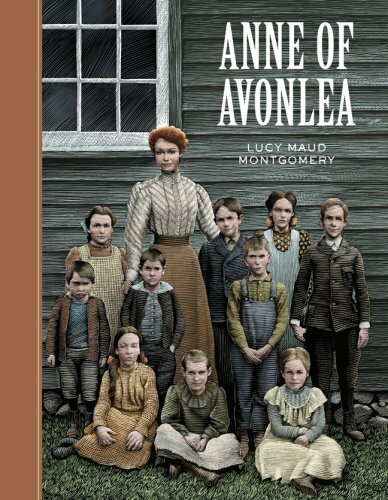 My favorite is of course the one where Anne eats her infamous liniment cake, but they're all delightful. Be sure to check out the early sketches at the bottom, including a couple of her (and Gilbert!) in school. Today's cover comes from the 2009 Puffin Classics relaunch and wow, does it kind of irrationally freak me out. I mean, is it just me or does it look like it was done in Microsoft Paint? It looks like I wasn't the only one not fond of it, because it seems like this (and the matching covers for the rest of the series) was pretty speedily replaced and is now rather hard to find. 2:25 - "dashboard." Okay, okay, obviously y'all know the word "dashboard" already, but it's possible you're wondering why it's being used in the context of a horse-drawn buggy. See, this is one of those words that has continued on long after its literal meaning has ceased to be relevant, sort of like how we still use an icon of a floppy disk to mean "save." When horses move quickly on dirt or gravel paths, their hooves would throw — or dash — muck up at the driver and passengers behind them in the cart or carriage or whatever. Thus, a board was placed at the front of the carriage to protect the riders. A horse-drawn buggy, with a dashboard sticking up between the horse and the passengers. When motorcars first came about, they were mostly made by the same people who made horse-drawn carriages and were pretty much just built with the same plans, only with an engine added. Once it became standard to have the engine in the front, it was only natural that the dashboard remain to separate it from the passengers, as it once did the horses. People already knew "the barrier right in front of you when you're driving" as "the dashboard," so the name stuck around. It eventually became a handy and natural place to set things and locate controls and gauges and such, so that today "dashboard" is practically synonymous with "instrument panel," leading to things like the Mac Dashboard. Pretty far from horses kicking dirt into your face! It thus became a byword for a prim and affected form of speaking. 14:13 - "coin-spot rug." Also known as a penny rug, these were made from small circular pieces of fabric, cut from scraps left over from clothing and such using coins as templates, sewn together to make a rug, mat, or decorative thingy. 26:42 - "animadverted." Well, this is a word I've never come across before! "Animadvert" just means to comment upon in a critical or unfavorable way. 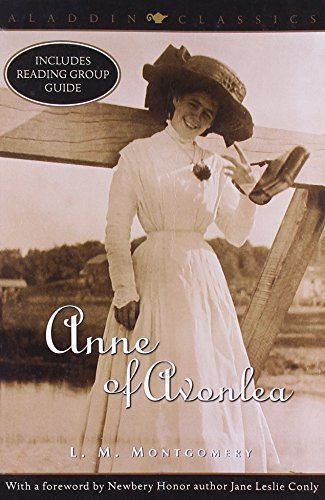 In which Anne and Diana try to bilk the hard-working citizens of Avonlea out of their money with mixed success and Marilla is duped into spending her golden years taking care of young children; and in which the narrator lets slip an Opinion about a character we've only barely met. Today's cover is from a Grosset and Dunlap edition from 1936, and is a great example of how the fashions of the time were often taken more into consideration than anything actually in the book. I mean, you can't even try to pretend that look anything like 1880s style, or even the styles of 1909, when the book was written. And I suppose you could generously consider her hair to be auburn there, which is at least sort of close to red, but really. You can at least get that right. 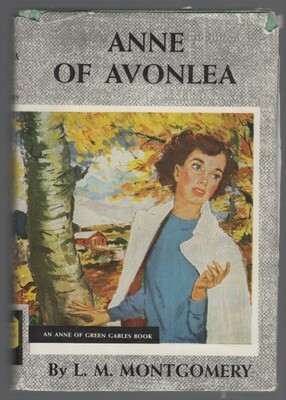 As it is, this looks a lot more like a Nancy Drew cover than Anne Shirley. Though, come to think of it, Nancy was also published by Grosset and Dunlap in the 1930s. It's quite possible it's the same cover artist, or at least a house style the artists were supposed to conform to. 1:38 - "All Sorts and Conditions of Men... and Women." The title of Chapter 5 is a reference to a line from The Book of Common Prayer, which (for those of us not in the Anglican Church) was a book that laid out prayers and services for specific occasions, like morning prayers, evening prayers, funerals, baptisms, etc. This line is from, appropriately enough, the "Prayer for All Sorts and Conditions of Men," which basically is a sort of all-purpose prayer for any in need of help. 2:47 - "Bliss is it on such a day to be alive." Anne of course properly attributes the source of her altered quotation to William Wordsworth. The poem specifically is the succinctly titled "The French Revolution as It Appeared to Enthusiasts at Its Commencement," and the actual line is "Bliss was it in that dawn to be alive, / But to be young was very heaven!" Man, the French Revolution sounds amazing! Really though, I'll stick with the scent of fir. 8:22 - The "vale of tears" that Eliza insists on seeing the world as is an old Christian phrase referring to the idea that the physical world is just a place full of sorrow and sadness that we leave behind when we go to heaven. Ah, that explains it! No one ever really makes reference to the "and quarreling" bit, just the fighting. It would take Gilbert's point a little less dramatic if he said he wanted to quarrel with disease and pain and ignorance. 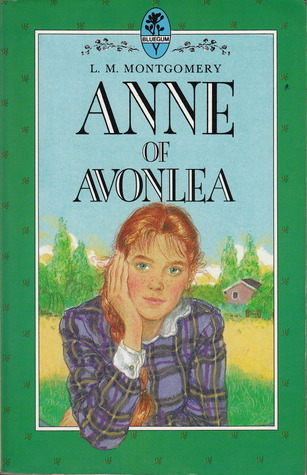 In which Anne confesses her bovine misdeed to Mr. Harrison and the two become friends, there is some disagreement about methods of classroom discipline, and Anne has a most tiring first day of school; and in which the narrator tries to remember what he recorded nearly two months ago, itself after a two-month break. 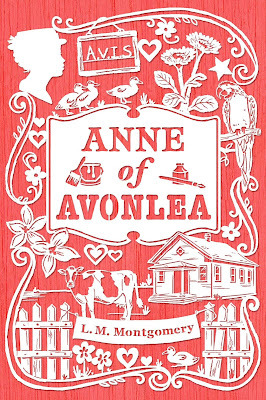 Hey, remember Avonlea? We're going to pick up right where we left off, of course, with Anne trepidatiously heading over to Mr. Harrison's house to confess about accidentally selling his Jersey cow. Here's this installment's cover, a lovely paper-cut design by Simon and Schuster as part of their Aladdin Classics series. I like how this incorporates various aspects of the book: the parrot Ginger, Anne's Jersey cow, the Avonlea Village Improvement Society. It sets it apart from the vast stretches of "Anne standing in a field" covers, which... okay, we'll be seeing several of them I'm sure, because the pickings are a little slimmer for this than for Green Gables. 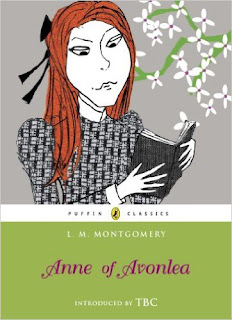 Simon and Schuster have done similar covers for a few other Anne novels, too! 8:31 - "as good a jorum of tea as you ever drank." A jorum is a large bowl or, more likely in this case, jug that is used to serve beverages; usually punch, but sometimes tea. It's sometimes also used to refer to the contents of such a vessel, often implying a great deal of such contents. Out of context, one might interpret "shining" to mean something like "beaming" or "eager" — which is definitely how Montgomery means it here — but nestled between "whining" and "creeping like a snail unwillingly to school," one wonders if maybe Shakespeare meant that their faces are shining with tears instead. I mean, read the rest of the speech. It's... not exactly optimistic. 28:57 - "slate bottle." This was actually a rather difficult one to find! Eliminating things like this and this still mostly brought up references to ink bottles, which doesn't make sense in this context as it clearly says that the bottle held water, and you wouldn't use ink on a slate anyway. The only (well, first, because then I stopped looking as I'd already gone pretty deep) explicit reference I found is in this 1889-1926 history of Eastling Primary School in Kent County, England, where a former student recalls "how happy she was when she... was given her own slate, her own water bottle with a hole in the cork, and a rag to clean her slate." I mean, you could probably have figured out that it was basically a very low-tech water spritzer for cleaning slates from the context and a basic knowledge of how slates work, but it's nice to have confirmation. Welcome to "Rob Reads to You." I'm Rob, and I'll be reading to you. New posts (try to) go up Monday, Wednesdays, and Fridays at 9 PM. Unless otherwise noted, the works read in "Rob Reads to You" are in the public domain. The recordings themselves by Rob Vary are licensed under a Creative Commons Attribution-NonCommercial-ShareAlike 3.0 Unported License.